Are you looking for methods on how to run two WhatsApp accounts in one phone, or how to use 2 WhatsApp in 1 phone? In this tutorial, we have shared various techniques that allow mobile users to run multiple or dual WhatsApp accounts in one single phone. WhatsApp is one of the most popular and commonly used Instant messaging apps these days, and due to its simplicity and easy-to-use interface, users are able to use it without any hassle. WhatsApp lets its users send and receive messages that are end-to-end encrypted so that only you and the person you're communicating with can read the content of the message, and nobody in between, not even WhatsApp. Each and everything on WhatsApp comes quite handy, but what is the most disturbing part that you come across? How to install 2 WhatsApp accounts in 1 Android smartphone? If you have a dual SIM smartphone, you might be willing to enjoy two separate WhatsApp accounts for your two different phone number. However, this is where WhatsApp puts limitations on its app users. WhatsApp does not allow its users to configure more than one WhatsApp account on their mobile phones. "How do I find an excellent solution to use 2 WhatsApp in dual sim phone that actually works?" Here below, we have introduced not one but multiple solutions to your problem that will allow you to run two WhatsApp accounts in one phone. There are primarily three ways you can install two WhatsApp on Android simultaneously. Many newer Android smartphones today allow you to create multiple user accounts on the device, or have a guest account. So, if you want to run 2 WhatsApp accounts on 1 phone, you can take advantage of the multiple users to set up an all-new profile separate from the primary account on your Android smartphone. In this parallel space, you can download second WhatsApp from Google Play Store to configure a new account from scratch. 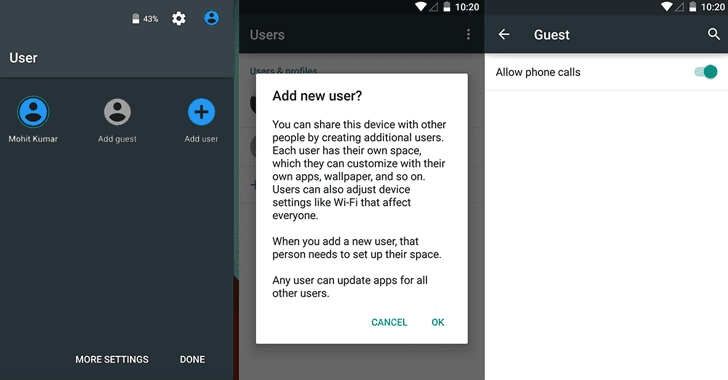 The multi-user feature is available in the Android's Lollipop and later versions, as well in some custom ROMs. 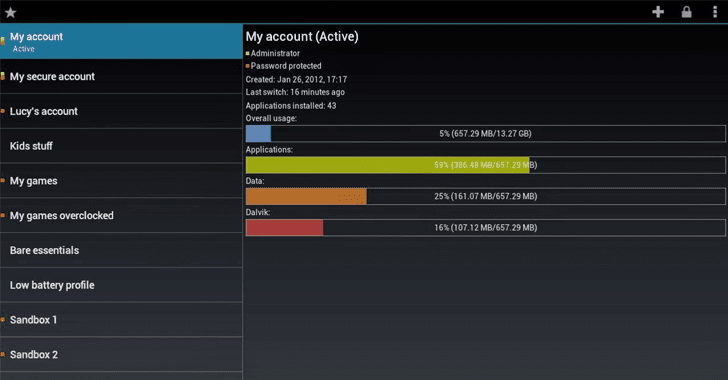 Add Multi-User in Android smartphone. For this, just go to Settings and click on Users and then Add User (or add a Guest account), or just pull down the notification bar, tap the user icon, and tap on Add Guest or Add User. After creating a new user, provide complete details to set up the new account. Switching to the New User will provide you with an all-new phone interface with default phone settings. Now it is time to install WhatsApp in the New User Mode by heading on to the Play Store. Once the new WhatsApp app is downloaded and installed, enter all the details, and provide your another mobile number which is not configured with your original active WhatsApp account. That's it. Congratulations, you have successfully install 2 WhatsApp accounts in one single phone without rooting or installing any other third-party software. With the multi-user feature, you can even enjoy more than two WhatsApp accounts on the single Android phone. Just make sure you also have a mobile number not connected to any active WhatsApp account, because WhatsApp by no means allows you to create two WhatsApp account using a single phone number. It's not unusual… many people create multiple online accounts on the same service so that they can efficiently manage various tasks or can keep their personal and professional life isolated. In such a situation, we sometimes feel the need to have multiple accounts of the same app on a single smartphone, not just WhatsApp. 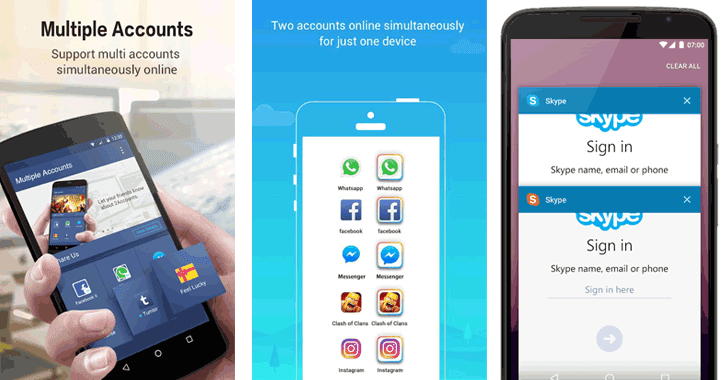 There are many apps available in Google Play Store that allows users to clone apps and support multiple or dual app accounts for favorite apps such as WhatsApp, Snapchat, Facebook, Instagram, YouTube, Amazon, Twitter, Skype, and others. Multi - clone and run multiple accounts of the same app on one device. Don't worry, you won't require root access for installing and running these apps. Moreover, these apps don't only allow you to run multiple instances of the same app, but also let you run multiple accounts of the same games. SwitchMe is an Android app that allows you to have two separate WhatsApp accounts on a single Android device, but this app requires your Android smartphone to be rooted. Although we do not encourage our users to root their devices, users should be aware of such apps. Switchme multiple account app allows you to log in and out of multiple user spaces however it needs root access to do this. However, users cannot access the other profile from their current profile because each account within the multiple profiles will have its settings, applications, and data. Make sure that you have WhatsApp app installed on your smartphone. Install SwitchMe Multiple accounts on your smartphone. Run SwitchMe Multiple accounts, it will ask for Superuser request that you need to grant. Now create a user profile with your name in the SwitchMe app. This profile will be an administrator account containing all the current apps and settings, and will also reflect your WhatsApp profile that is already installed on your smartphone. Now create another profile using a different name by tapping on the Create Profile button in the SwitchMe app, and then choose the Switch option by selecting this account. Now your smartphone will restart automatically and once it is ready to use, install official WhatsApp again from Google Play Store and register it for the different phone number. That is it. Unlike multi-user feature in Android, the Free version of SwitchMe allows you to enjoy only 2 WhatsApp accounts on one single phone. However, SwitchMe's paid account allows you to run multiple WhatsApp accounts. If you were looking for how to use 2 WhatsApp in dual sim phone, OGWhatsApp was the first choice of readers a few years back. While running your regular WhatsApp account on your smartphone, you can follow some simple steps (below) to run a different WhatsApp account on the OGWhatsApp. Take a complete backup of your WhatsApp data and restore it. Delete all the WhatsApp data by going to Settings → apps → WhatsApp → Clear Data. Rename the /sdcard/WhatsApp directory to /sdcard/OGWhatsApp. You can use any file manager for Android to do this task, or from Windows. Uninstall your original WhatsApp app from your Android device. Now install OGWhatsApp on your Android smartphone. Once installed, remember to verify your old number that was previously registered with the original WhatsApp to OGWhatsApp. That is it. Now reinstall the official WhatsApp for your other number from the play store. Update: OGWhatsApp application for multiple WhatsApp account is not available now. So you can Choose any of the remaining methods to run dual WhatsApp accounts on one phone. It should be noted that currently there are no such methods available to run multiple accounts for WhatsApp web because of its unique QR code and back-end mechanism. If you are looking for methods to run two WhatsApp accounts on one iPhone, we will write a separate article on it. Stay tuned!